A section of Seventh Street in Osage City is paved for some areas, but is mostly gravel. 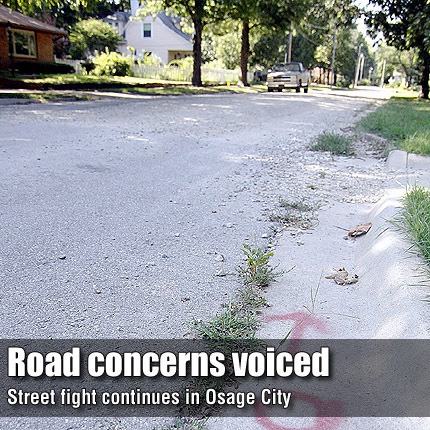 Several homeowners along the deteriorating street spoke at the Osage City Council meeting July 12 following discussion to repair the street with asphalt. OSAGE CITY—While the topic of the Osage City Council’s rejection of a long-term trail project drew the most public comment during the July 12 meeting, citizens who live on Seventh Street between Lincoln and California streets also spoke about the condition of their street and the amount of time it has taken to repair it. The street has been in disrepair for more than a year and was the subject of previous discussions that led to the city implementing a truck route. During the meeting, the council reviewed bids received to repair the street with concrete, but first tabled the bids, then decided to reject them to seek other bids to repair the street with asphalt, contrary to recommendations by staff and the city’s engineer. Seventh Street resident Marc Ballinger said he did not like going to his home due to the condition of the street.